How do you figure out your calling, your passion in life? My sister, who is a nurse, found her calling through having appendicitis as a child. 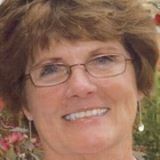 The experience of being in the hospital—scary or distasteful for some—left her awestruck and with an image of her as a nurse in a white uniform and a little white nurse’s cap with a black stripe. An old image for sure, but it got her adrenaline going then and she still loves her job today (now partially retired). of the employee newsletter of her hospital which included this lovely picture. HuffPost Canada ran a piece last year about an award-winning journalist, Michael Ignatieff, and eventual professor and politician who started out as a copy boy. Interestingly, since the job is now archaic, there are no books on Amazon that look like they have anything to do with a copy girl, unfortunately. as a business manager (um… yeah … not exactly my career aspiration). With Rodney Maust. 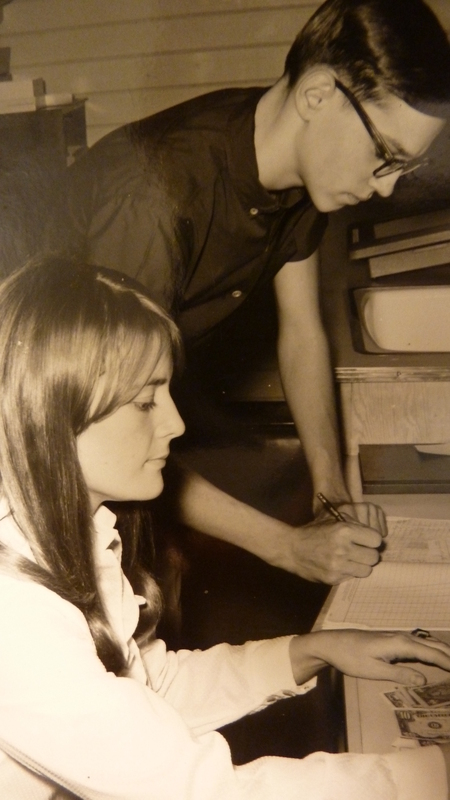 Dorcas Kraybill and me working on The Phoenix my senior year of college. Tear sheets from The Weather Vane. 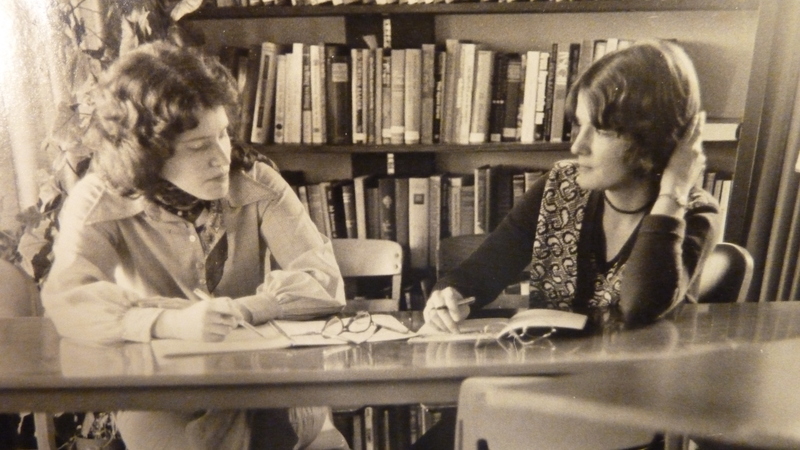 Which I did, and still am moving in to various writing/editing positions for 38 years now. 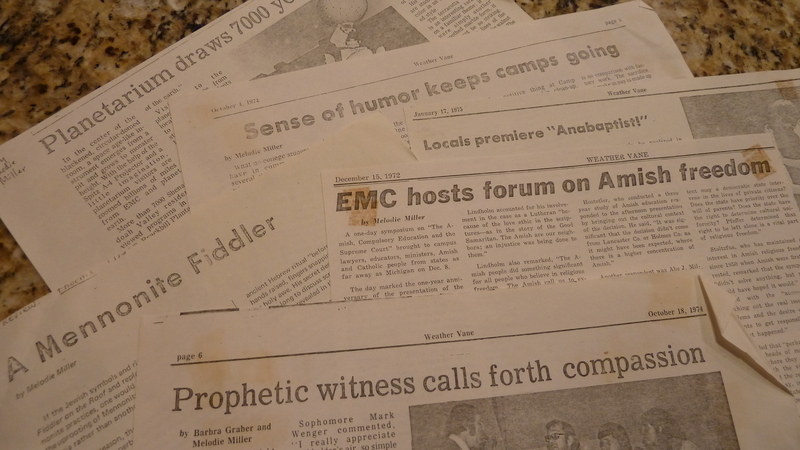 I began July 7, 1975, about one month after graduating from EMU. I could go on, but this is long enough. A couple weeks ago I wrote about some of the odd jobs I did along the way, and when I was done with that post, I realized oh! I didn’t even include the jobs (mostly unpaid) that actually took me to a job I continue to enjoy and that gets my adrenaline going almost every day. Oh, and P.S., I still write volunteer articles for our church newsletter, The Nous at Trinity Presbyterian (sample here reused in Another Way, which originally appeared in The Nous). What influenced you most in pursuing the job you have or aspire to? If you are currently a stay-at-home mom or dad what led to that decision and role and how do you feel about it? What if you never have an adrenaline rush about work? How can hobbies fill that role? An earlier post also talks about some of my early published works. Never knew all the steps before to you becoming a writer…very interesting. … I’d like to see a blog post sometime on your many jobs along the way … looking for photos for this I found you dealing with pizzas when you did deliveries, and you on a golf cart … remember? Then there was the animal shelter ….